Since Dragon Con’s humble beginnings in 1987, it has expanded to encompass the majority of the downtown Atlanta area every Labor Day weekend for a mix-mash of cosplay, folk music, charity fundraising, guest panels, and more. This year, over 80,000 people attended to celebrate Dragon Con’s thirty-first anniversary. Richard Garriott de Cayeux and Starr Long, both long-time veterans of the video game industry whose working relationship dates back to the early days of the Ultima franchise. 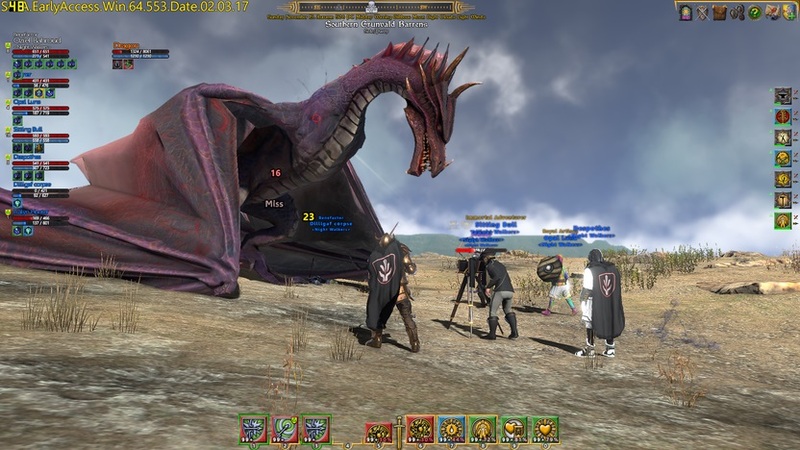 Their latest venture is an MMO title, Shroud of the Avatar that is currently in early access on Steam. During Dragon Con 2017, I caught up with Mr. Garriott de Cayeux and Mr. Long and talked with them about Dragon Con, developing Shroud of the Avatar, and just what lies in the future for the game. You can find out more about Shroud of the Avatar and the team behind it on their website and the official forums, like them on Facebook, follow them on Twitter, subscribe to them on YouTube, and subscribe to them on Instragram. 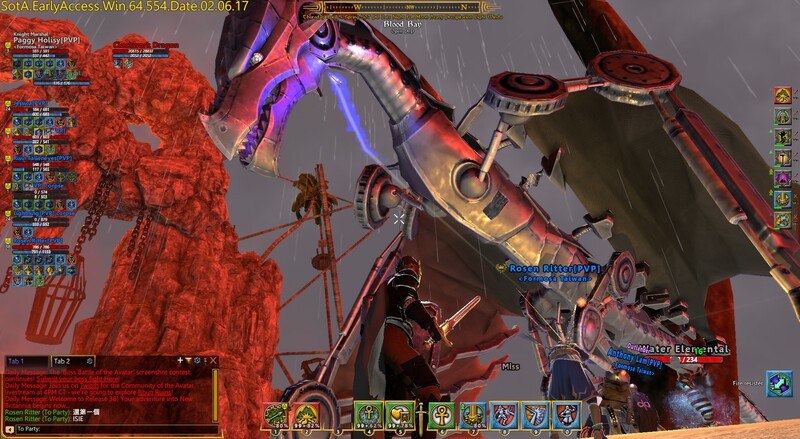 You can also buy Shroud of the Avatar over on Steam Early Access. There is also a free trial going on from September 7th to September 27th, 2017, so be sure to check it out! You can find out more about Dragon Con at their website, follow them on Twitter, and like them on Facebook. The dates for Dragon Con 2018 are from August 30th to September 3rd, 2018 and tickets are currently on sale. This is Part Two of a Three Part Interview. You can read Part One here and Part Three here. Operation Rainfall: You mentioned earlier [OR Note: In Part One, which is linked above] that you can purchase items with real-life currency or in-game gold. How do you balance allowing players to purchase [useful] items, but not [allow] them to ‘pay-to-win’? Starr Long: So everything you can get in store is purely cosmetic. It’s just things like clothing and housing and stuff like that. So anything that truly relates to game balance are things that are crafted or earned in the game. So we don’t sell anything that’s ‘power’. 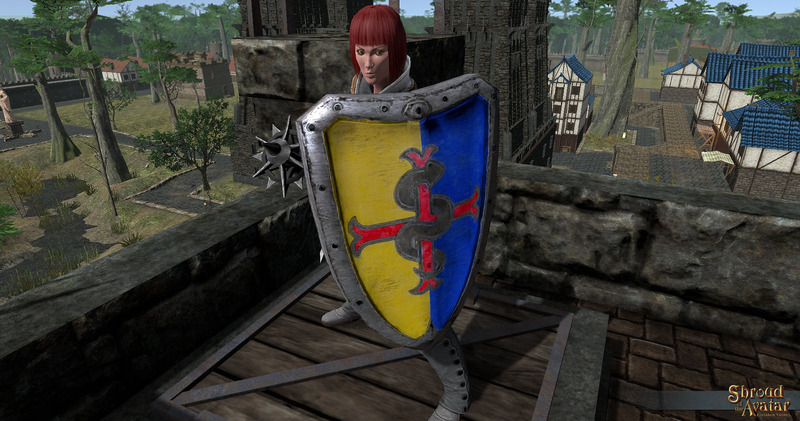 Richard Garriott de Cayeux: And in fact, even what you can buy – one of the most interesting things you can buy these days- if we invent a new fanciful-looking plate armor, you can use that as a pattern that any crafter can then use to make plate armor that looks like it. And that way, again, the qualities of that armor is made by a crafter. The look of it might be a pattern you can buy from us on the store. So again, we’re selling the cosmetic overlay on the power that players create. SL: So we don’t sell a ‘stronger sword’, we just sell a ‘prettier sword’. 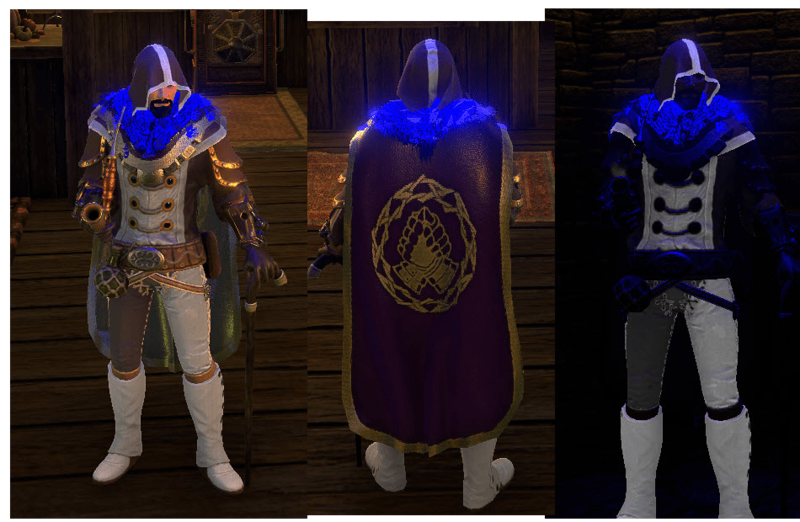 The best gear in the game is crafted by players, but players can buy cosmetic patterns through the online Shroud of the Avatar store. OR: Have you explored the possibility of selling a ‘stronger sword’, as you put it, like in Everquest II’s Station Exchange or through your store directly? SL: I’d say no, but what we do have on our forums is a player marketplace, so we allow players to exchange virtual goods for real currency with each other. But we don’t do that. So if a player makes a powerful item, we allow them to sell that to each other for real dollars. We just don’t do it. OR: From the ‘chicken room’ in Release 1.0 – y’all are smiling, so you know what I’m talking about- until now – y’all just put out release 45.0– the community has been heavily involved with the game, giving feedback to you on the forums and in different threads. And y’all do daily activities such as the ‘Stand up Corner’ on the forums. What was the most unexpected piece of feedback y’all have been given so far, that you realize ‘Hey! This would make a really good improvement for the game!’? RGC: –Mostly music and commentary. SL: And players were like ‘Wow, this would be really cool to listen to this in the game.’ And then another player volunteered and said ‘Yeah, well if you guys would support the tech to stream the web radio in the game, [then] I’ll make the 3D object’- because we have some steampunk technology in our game, even though it’s mostly medieval fantasy. We were like ‘that sounds like a cool thing.’ Another player said ‘I’ll write the unity plug-in to allow streaming.’ And were like, ‘that’s cool, sure.’ And so we went through the whole process with the players contributing the assets and we got it working. And so now there’s a little radio that players can put. And it started out just as simple as people putting it in their house, and they could listen to the radio station or at the pub, they would have dance parties. But then touched other emergent gameplay where players invented a sport called ‘Gustball’, which is my favorite kind of emergent gameplay. The best time is when players take things that aren’t intended as ‘toys’ [in a sandbox environment], and they make ‘toys’ out of them. And Gustball is a perfect example because ‘Gust’ is a combat spell in the air magic school, where you send a gust of air that pushes an enemy away from you. It’s crowd control. 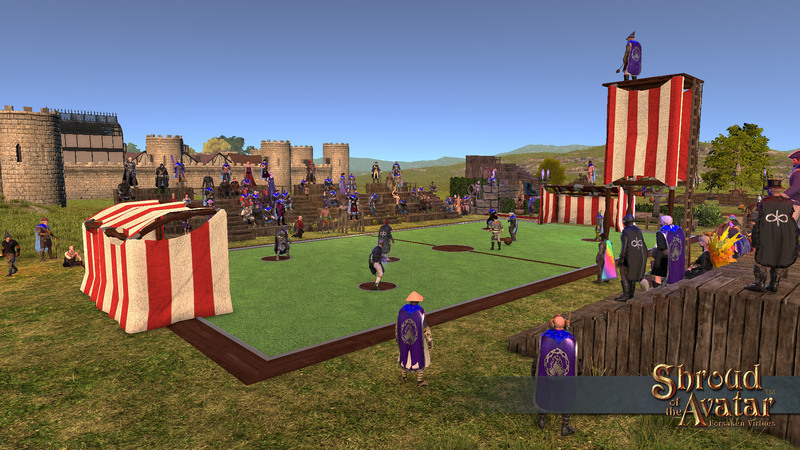 Players took our home decoration system, and by putting objects on the ground, they created goals and one player would volunteer to be the ball. And then they would use the Gust spell to push that player around. And another player would be the referee to keep score on how many times that player would get pushed into the goal. And then they realized ‘Well, okay, a player doesn’t have to do that, we can use pets.’ And so there was a brief moment were they were using cats and dogs. And we were ‘Okay, this is kind of dark. So why don’t we make them an actual ball?’ So we made them an actual gustball. It’s a little leather ball, which is also a pet because you just summon the gustball like you would a pet. And then we made up a Gustball field. But they use the radio to do sports casting –and they have a league- but they use the radio they created earlier to comment on the sport that they invented. So it’s this crazy loop of all player created content in the sandbox. And this is what makes sandboxes beautiful. And this all goes back to an initial question of ‘could we stream radio into the game?’. But the one I found out about last night – So our combat system is fairly unusual in that you build what are called ‘decks’. So you take your combat skills and you assemble a deck – like a Magic: The Gathering kind of thing- and then your skills are dealt to you while you’re playing and you assemble them into combos while you’re fighting. And you can also have multiple decks built at any given time. You can switch between them, so you can have a deck of mostly fire magic – it’s a classless system- or a deck that’s healer of all your life spells. And you can match equipment to each deck, because all of our gear can be highly specialized. Like, this gear is attuned to life spells or this gear is attuned to fire spells. Well, I found out last night that one of our players who’s very into fashion doesn’t use the deck system necessarily for combat, she uses it for quick costume changes. So we allow you fifteen decks, so she has fifteen different costume changes queued up. So her decks aren’t about combat decks, they’re about fifteen different costume changes. RGC: This is the first time I’ve heard this story, that’s actually really clever. SL: So it’s a sandbox use of things that were intended for combat as a ‘toy’. OR: Will this feedback system continue even after the game finally launches- will you still take in community suggestions? SL: ABSOLUTELY. Our intent is to remain in open development forever. So we plan on doing monthly releases, we plan on continuing to solicit feedback. We love this development model. It is a very, very, VERY different way to do development. It’s a very challenging way to do development. But we love it. We think our community loves it too. We wouldn’t have it any other way. And we want to continue doing it forever. 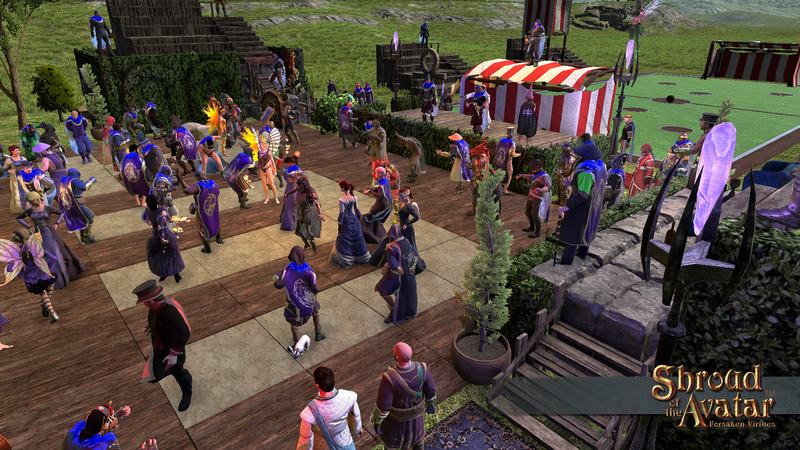 Community events ranging from ‘Dustball’ to dance parties occur frequently in Shroud of the Avatar. OR: In July 2016, y’all announced that you were going to maintain a ‘persistent’ world and you would not be wiping characters [other] than the storyline flags before launch. What incentive is there for someone who is going to come to the game at launch and would just want to pick it up then? SL: That’s a great question. First of all, since we’re a classless system, when you start using any skill, it starts to level up. And we have a regulatory system for that [so] you can’t master every skill. So if you start to master one skill, you start to decay other skills. So no one can be the master of every single skill. And so even people who’ve been playing forever aren’t going to have every single skill in the game. They’re going to have to choose at some point. And at the highest levels, the mastery sort of flattens out. And so you’re going to get diminishing returns at the highest [levels]. So we have a fairly quick ramp-up at the beginning, and then it sort of flattens out. So even if you’re coming in later, you’re going to fairly quickly be able to catch-up and then you’re going to get to that same point they’re at. You’re going to be able to get to the level 100 in a skill – which is a Grand Master- in maybe not as many skills as they have, but enough that that you’re going to be able to adventure with them. And in most games, where if I’m lower level and they’re higher level, we literally can’t adventure together and I can’t contribute at all – in our game, if someone is higher level and I’m lower level, I can actually go adventure with them and I can contribute. RGC: We have a much flatter curve at the beginning. SL: And so you can actually go adventure with higher-level people and contribute. And I don’t think people should be scared of people who’ve been around and who have been playing the game for awhile. And one thing that’s also different about our game is that our community is incredibly welcoming to new players. There’s an entire group of players called the ‘Hospitallers’ who’s entire goal is to welcome new players. They hang out in the starting areas of the game and hand out stuff. Like ‘Hey, here’s some potions’, ‘Here, have some money’, ‘Hey, have some gear.’ So we have an incredibly welcoming community. 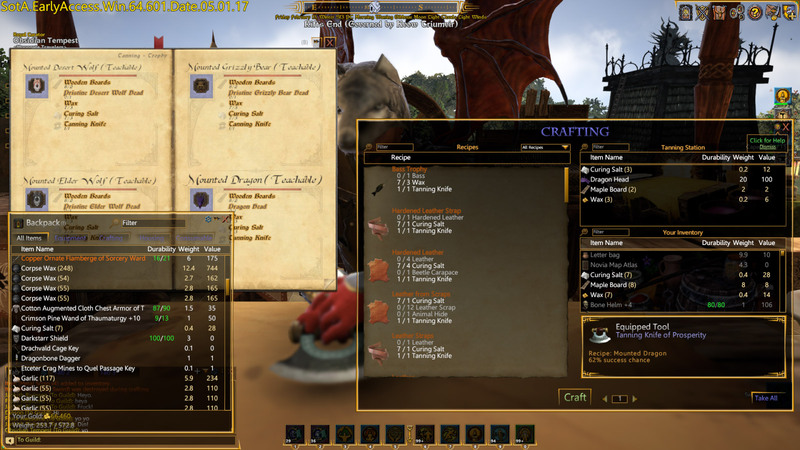 Crafting is a central component of the player experience in Shroud of the Avatar. OR: Going to the other end- you’ve both said on more than one occasion that the best gear and items in the world are going to be developed by the players. What is endgame content going to look like? Because normally, you raid to get the best loot. SL: -But you’re not very effective in combat. And the Obsidian Cabalists who are our ‘Ringwraiths’, depending on when we have a fully-functioning Celestial System -so when things align – when certain celestial events align in the sky- they lay siege to cities based on the virtues. And if you fight those guys and defeat them, you get some of their gear. And again – which is very cool and unique looking masks with anti-virtue symbols on them- which has power, but is cursed. But, as Richard mentioned, you can break those things down and get the patterns for them and you can apply them to the gear you make. So a lot of what you make and raid for is those patterns. So you’re not raiding for the power of the gear you’re finding. There’s one region of the game called the Perennial Coast, which has an Asian flair to it. So if you want katanas, you go fight in that area. And it’s not like those katanas are powerful, it’s that they look cool. So you’re going to break them down and get patterns from them so when you forge your swords, you can make them look like katanas. OR: Why did you choose to go with this method of making the best items/gear created by the players, instead of locking it behind content? RGC: What’s interesting is that we actually took a journey that ended there. We started with the simple idea that we wanted things like ‘Maker’s Marks’ to be truly universal. So we knew we wanted to celebrate crafters. As we started down this path of really devoting a crafting system that allowed a lot of diversity, allowed extremely unique items that were extremely tailored to the individual player that you’re making that piece of gear for, and keeping around the history of the object – starting with the maker- so that we could do that celebration. And then we discovered over time that in our own mind’s eye, watching the player economy evolved, we realized how important that was. And we just came to this revelation somewhat later about these raids in other games. And so we backed off, and we said ‘Okay, let’s actually remove ourselves from it’ and instead of spawning in the game finished goods that were powerful –[besides putting] in some starter gear because you needed it- but [otherwise], [just] putting in [the game] the raw materials and resources. But then as that evolved, we said ‘We still want these artifacts, these things that are unique, but they can’t be more powerful than what the players make. They can be the things that are augmented on the side or the patterns that you can pull apart.’ So it was a journey that has taken us a couple of years to evolve our thinking. But I actually think where we ended was something quite powerful. We really are making a player-created world. We’re providing the sandbox tools, and now it’s their job to make the best stuff. (At this point, Richard Garriott excused himself from the interview in order to attend another interview, but Mr. Long remained to answer my questions). SL: So the other answer to that because we’re a classless system, traditionally, for drops, you can drop a piece of gear and it’ll be ‘okay, this is a ranger bow’ or ‘this is a paladin shield’, but we’re a classless system, so we can’t drop a piece of class gear because you might have a build that is a fire dual-wield death mage. [So the question is] ‘What do I drop for you?’ Well, what you’ve done is you’ve either gone to some crafter and said ‘Bespoke, build me the dual-wield death-fire-katanas that have one katana with a necromancy gem and one katana that has a fire gem.’ Or you’ve gone to all the vendors in the game and found those. So it’s better to let the players generate the content for each other. And plus, because it’s a use-based system and people can modify their character at anytime like ‘I don’t want to be the death fire guy anymore, I am going to stop doing fire magic because the devs nerfed fire the last release since it was OP, and so I’m going to yank the fire gem out of my katana now’- well, then that drop I gave you last time all the sudden doesn’t have value for you. And that whole thing fell apart, and now I’ve got to change the drops on them. So we just pull ourselves out of that equation and let players do all that for each other. Now that’s not necessarily easier -it turns out that it’s way harder- but I think if we can get it right, which we haven’t yet, full transparency – we haven’t gotten this right yet. Loot isn’t satisfying yet in the game. We need more of it. It needs to feel better. We also don’t yet have the loot working with the economy. We’re still in Early Access, so there isn’t enough player participation yet, but that’s alright. That’s just a symptom of Early Access. And we need better loot. But that’s just where we are in the development cycle. We’re still in that last 20% where Richard always talks about 80% of the quality in the game comes in the last twenty percent of the development. OR: One of the more unique things in the game is when you die, there is a skill decay. Why did you choose to utilize this in the game, versus a gear repair system, for example? SL: Well, we also have a gear repair system. But the reason we have a decay system – which we’re considering some alternatives – but it goes back to because we’re a classless system, and we have a lot of different skills, and let we let people level up those skills independently of each other. The other alternative is to let people level them up infinitely, so at some point, if we did that, then everyone would have every skill maxed out and they would basically no challenge left in the game and they would basically be gods. And at that point, we would have nothing to give them that would be challenging. And there would also be no interdependency between players. There would be no need for me to adventure with anyone else because I would have all the skills. Also, there would be no need to have any specialized gear because any gear would work with me. One thing that they failed to mention: There are DRAGONS in this game. OR: This is the first of five episodes. Have you started planning the second episode and beyond, yet? SL: So Richard and Tracy, when they wrote the outline for the plot for the first episode, they wrote very rough sketches out for the plots for two through five. More detailed for two – then less and less and less for three, four, and five. And as for feature sets, we have a big ‘bucket list’ of everything we’d like to do after episode one launches, which includes boats, mounts – you know, it’s all the stuff we didn’t have time to do this time around. Treasure maps, those kinds of things. 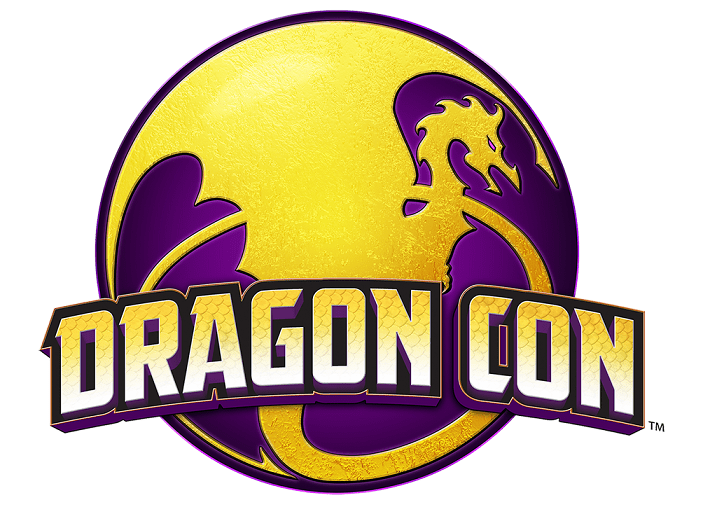 The Dragon Con logo is used courtesy of Dragon Con. 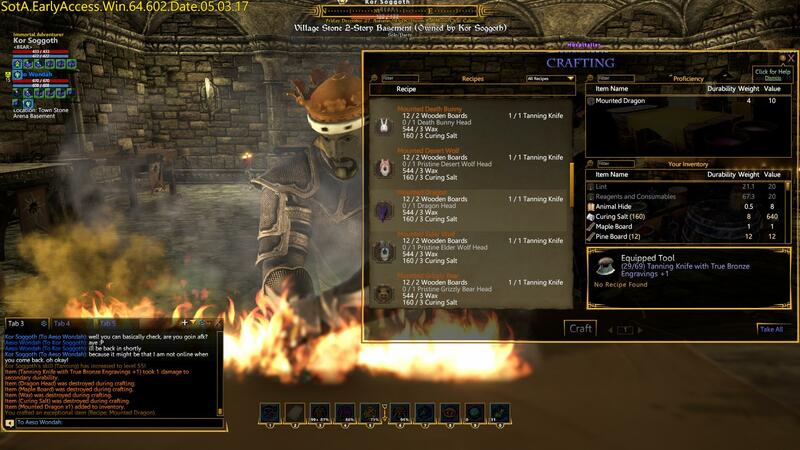 All other images and videos from Shroud of the Avatar used are courtesy of Portalarium. The dates for Dragon Con 2018 are from August 30th to September 3rd, 2018 and tickets are currently on sale. Have you listened to Avatars’ Radio? What do you think of skill decay as a death mechanism?